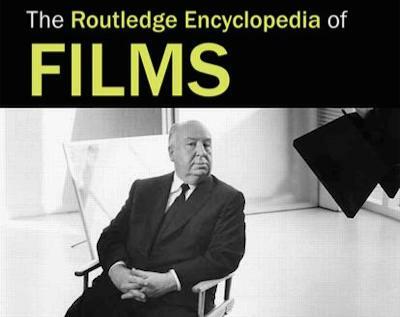 The Routledge Encyclopedia Of Films, edited by Sabine Haenni, Sarah Barrow, and John White, is a survey of "world, classical ('classic') and independent cinema over the past 100 years". From the same publisher as the excellent Encyclopedia Of Early Cinema, the Encyclopedia Of Films contains 195 entries, covering 197 films (with the Three Colours trilogy treated as a single entry). The selected films each receive a fairly substantial analysis, in essays of around 2,000 words. The editors begin their introduction by emphasising that they have selected a representative sample of films rather than a list of masterpieces: "This book is not an attempt to assert that the films discussed here are the 'greatest' or 'best' films ever made by film-makers from around the world." In fact, they reject the notion of a hierarchy of classic films: "There is neither effort, nor wish, to promote a particular canon of world cinema." Nevertheless, their selection does appear canonical, which I would argue is a strength rather than a weakness. The Encyclopedia is similar to the first volume of the International Dictionary Of Films & Filmmakers, edited by Nicolet V Elert and Aruna Vasudevan. The International Dictionary's essays on each film are slightly shorter than the Routledge Encyclopedia's, though in other respects the Dictionary is superior. It covers almost 500 more films, and many of its entries include large stills, while the Encyclopedia is not illustrated. The Dictionary provides extensive bibliographies for each entry, while the Encyclopedia has only a handful of references per film. Also, the Dictionary's contributors include many first-rate film critics and historians (Erik Barnouw, John Baxter, Michel Ciment, David Cook, Douglas Gomery, Nick James, Kim Newman, Gene D Phillips...), in contrast to the lesser-known contributors to the Encyclopedia. 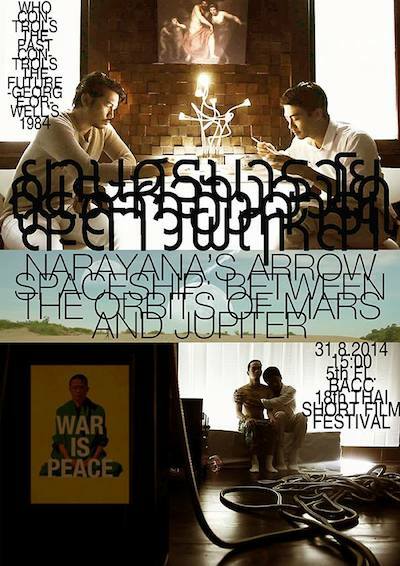 The 18th Thai Short Film & Video Festival opens on 28th August at BACC in Bangkok. The Festival will run until 7th September, and all screenings are free. The 11th Festival was held at Bangkok's now-closed EGV Grand Discovery cinema, though the 12th, 13th, and all subsequent festivals have been held at BACC. The film ยานศรนารายณ์: ระหว่างวงโคจรดาวอังคารและดาวพฤหัสฯ, which was previously shown as part of the pre-Festival Marathon, will be screened on 31st August. A prophetic film, it was inspired by George Orwell's 1984 and produced before that novel became a symbol of the anti-coup movement. It's an extract from a feature-length film, though some of the dialogue has been self-censored to avoid accusations of lèse-majesté. The credits have also been blacked out, and the film was submitted to the Festival anonymously. (I'm sworn to secrecy.) Another extract from the same film was screened as a stand-alone short in 2012. Prayuth Chan-ocha, the leader of this year's coup, was appointed (or anointed) Prime Minister yesterday. The National Legislative Assembly voted 191-0 in favour of Prayuth's appointment. There were no alternative candidates, no dissenting votes, and Prayuth was not even present to accept the nomination. The result was hardly surprising, as most NLA members are military officers and all were chosen by Prayuth's NCPO. Earlier this week, the Assembly approved the NCPO's budget proposal by a vote of 183-0, again without any dissenting votes. It's clear that the NLA is merely a rubber-stamp legislature, with no inclination or ability to challenge Prayuth or the NCPO. As army chief, head of the NCPO, and Prime Minister, Prayuth now wields almost absolute power. Two members of the Prakai Fai Karn Lakorn theatre group have been arrested, following a police investigation into a play staged by the group last year. The play, เจ้าสาวหมาป่า, was performed at Thammasat University on 6th and 13th October, as part of a week-long commemoration of the 40th anniversary of the October 1973 pro-democracy student uprising. Several members of the theatre group were interviewed by police in November last year. In June this year, they were summoned by the NCPO and questioned about the play. One of the actors, Patiwat Saraiyaem, was formally charged with lèse-majesté yesterday, and writer/director Pornthip Mungkong was charged with the same offence today. shall be all deemed lawful"
In June, NCPO leader Prayuth Chan-ocha announced his three-step pathway to a new election following this year's coup. Now it seems that the country has entered the second phase of Prayuth's plan, as anti-coup protests have fizzled out and the NCPO has begun establishing an interim government. The prospect of military detention and court martial has successfully deterred any anti-coup activity, and even symbolic protests have now stopped. 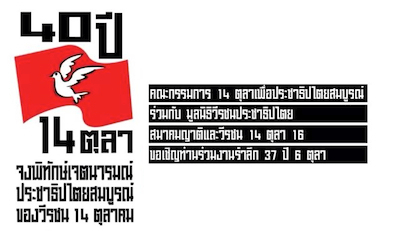 Instead of promoting reconciliation, police encouraged people to submit photographs of protesters, for a 500 baht reward. After the last protest, on 8th June, the deputy police chief claimed that the protesters "are causing damage to our country... They are creating a bad image for the foreigners." Apparently he didn't consider the image created by 5,000 soldiers on the streets of Bangkok. A propaganda campaign to "bring back happiness" has been launched by the military, with free entertainment being provided in partnership with the private sector. Thousands of free tickets to see the patriotic film The Legend Of King Naresuan V were distributed on 15th June. (Cinemas were required to install CCTV cameras to record and identify any patrons who left the screenings early.) Rights-holder RS was persuaded to allow World Cup football matches to be broadcast on the army's terrestrial television channels 5 and 7. Prayuth has issued a list of twelve values that children should uphold; incredibly, one of these values is "Correct understanding of democracy". In another PR exercise, army spokesman Weerachon Sukhonthapatiphak gave a press conference at the FCCT in Bangkok on 11th June, euphemistically describing the military takeover as an "intervention" rather than a coup. He insisted that people were "invited", rather than 'detained', by the military; implausibly, he claimed that former PM Yingluck "was free to go back home on the same day." After Same Sky editor Thanapol Eawsakul's detention, a colonel explained that they would "interrogate him and re-adjust his attitude", in contrast to the rosy picture painted by Weerachon. Some detainees have even accused the army of torture. To demonstrate its commitment to the country's administration, the NCPO has already allocated billions of dollars to pay for new policies and infrastructure projects. The first of these was a pledge to reimburse the farmers who had not been paid following Yingluck's rice subsidy scheme. The NCPO also announced transportation megaprojects, including two high-speed train lines. When Yingluck proposed a similar plan, with almost exactly the same budget, it was vetoed by the Constitutional Court, which ruled that high-speed rail was not necessary in Thailand. Yet the NCPO's almost identical proposal has attracted no such comments. Martial law also precludes any debate on the NCPO's interim constitution, which was published on 22nd July. The constitution includes an amnesty for the coup leaders, as did the 2007 charter: "Amnesty shall be granted to NCPO and NCPO leaders, as well as individuals who take part in or conduct actions related to taking control over state administration" (article 48). When Yingluck proposed a political amnesty last year, she was criticised by all sides, triggering the PDRC protest, though there has been no criticism of the military's amnesty. The constitution also states: "NCPO Announcements and Orders... shall be all deemed lawful, constitutional and final" (article 44), effectively giving Prayuth absolute power. The National Legislative Assembly, appointed by the NCPO, held its first session on 7th August. 105 of its 200 members are serving or retired military officers. Next week, the NLA will vote for a Prime Minister, and Prayuth is widely expected to be chosen. The Bangkok Post's military reporter, Wassana Nanuam, is known for her high-placed sources, though maintaining this access to top-level military personnel also compromises her objectivity. She wrote an especially obsequious article on 19th June, almost begging Prayuth to become PM: "Confidence in Gen. Prayuth is overwhelming. Many Thais think we are in dire need of a strong, decisive leader... In their view, Gen Prayuth is a hero who has freed the country from its troubles." As is the case with the lèse-majesté law, absolute censorship means that only hagiography is permitted. The most substantial volume (a tall, narrow hardback with many fold-out pages) is an expanded and completely revised edition of Bizony's 2001: Filming The Future, documenting "the story of the world's most impressive science-fiction film". It includes concept art and hundreds of photographs from the Stanley Kubrick Archive, though surprisingly there are no reproductions of Kubrick's notes or correspondence. There are limited footnotes and an equally brief bibliography. 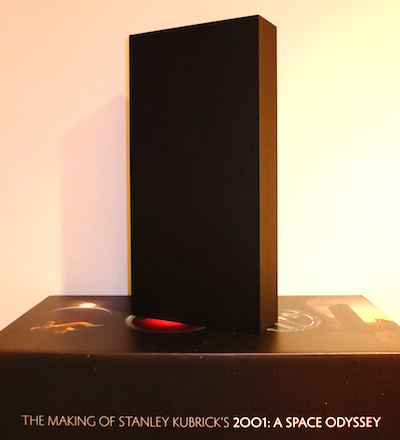 The other hardback volume, titled 2001: A Space Odyssey, a wide book that echoes the film's widescreen format, is a collection of stills from the film. The frame-enlargements are noticeably darker than they appear in the film itself, in contrast to the bright, glossy stills in The Stanley Kubrick Archives (also published by Taschen). 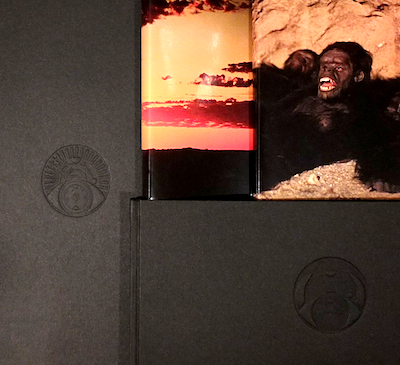 The book was designed by M/M, who also created Taschen's book about Kubrick's Napoleon. 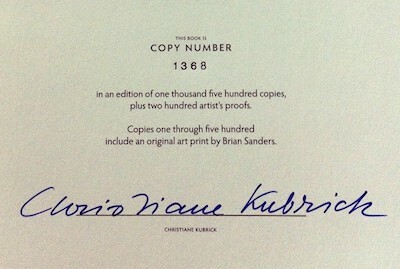 Like Napoleon, The Making Of Stanley Kubrick's 2001 is a limited collector's edition: only 1,500 copies are available (mine being #1,368), all neatly signed by Kubrick's widow, Christiane. Napoleon, with ten volumes all contained within an enormous book, was a more substantial and integrated tribute to a Kubrick project, though such a definitive book on 2001 may be impossible, due to the sheer quantity of archive material. 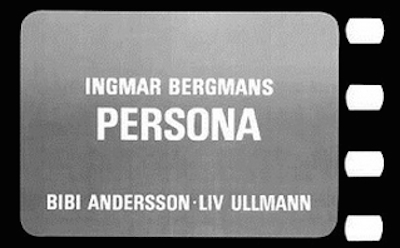 One indication of the attention to detail in the book's design is that its title is rendered as 2OO1 (using capital Os rather than zeros), as in the film's title sequence. There are already numerous books devoted to 2001, including The Making Of Kubrick's 2001 (by Jerome Agel), The Making Of 2001: A Space Odyssey (by Stephanie Schwam), 2001 Memories (by Gary Lockwood), Moonwatcher's Memoir (by Dan Richter), 2001: The Lost Science (by Adam K Johnson), Are We Alone? (by Anthony Frewin), and 2001: A Space Odyssey (by Peter Kramer). The 2001 File (by Christopher Frayling) will be published in the near future. 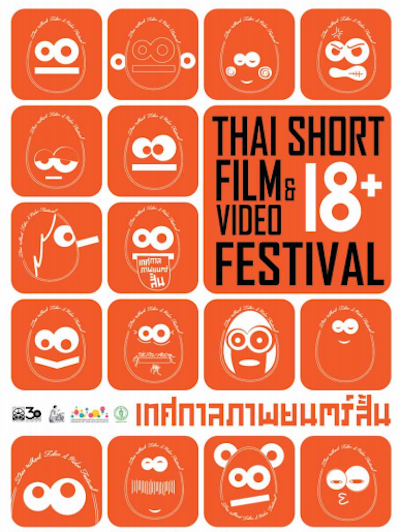 The 18th Thai Short Film & Video Festival will begin later this month, screening a selection of around sixty titles chosen from over 500 films submitted. Before the Festival opens, all 500+ submissions are being screened at BACC from 2nd July until 6th August. All screenings are free. Tomorrow's Marathon session includes the short film ยานศรนารายณ์: ระหว่างวงโคจรดาวอังคารและดาวพฤหัสฯ. 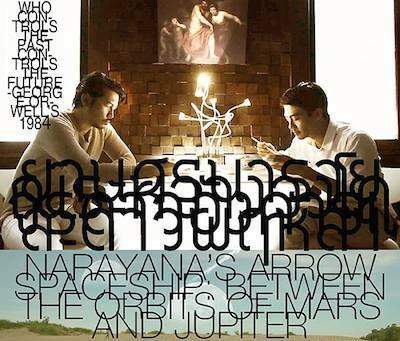 The film was made by a recognised Thai indie director, though it was submitted anonymously and will be shown without credits. (I'm sworn to secrecy.) It's an extract from a feature-length film, though some of the dialogue has been self-censored to avoid accusations of lèse-majesté. The film it was excerpted from was inspired by George Orwell's 1984, a novel which has since become an anti-coup symbol.